Old people are grumpy. They are less patient. They smell weird. They talk about boring things and have crazy ideas about how the world should be. This is how I always thought about old people. But as I get older, I feel like… I get it. I’m not tired or wore out like I always thought old folks were. I don’t have an abundance of time to drink coffee and fix all the world’s problems by complaining about them as I assumed all the old folks did. But still, I get it. Seasoned citizens are the way they are… I think… because the world has eroded the relevance of the things they’ve always thought of as valuable, and it comes to appear (to them) as apathy, laziness, and a loss of formality and professionalism. But those participating, creating and shaping culture today see new ideas as either a rejection of the status quo, or a step towards something better than we’ve ever had before. And that has to be right. It has to be. Things have gotten better generation by generation pretty objectively. Health, education, lifestyle. Millions of people have it better now than even the richest of the rich had it 100 years ago in many ways. So why do I feel myself ready to hop off the wagon train of progress? Just content to put down my roots here with what I know, what I’m happy with, and let that be that. I can attest that it’s literally frustrating trying to wrap my head around why what is new is better sometimes. And I can’t quite understand why. Last night Andrea was struggling trying to watch a movie. We have a smart TV with Netflix built in. Problem was, every 5 minutes, the Wi-Fi would disconnect. I don’t know what time she finally got it fixed, but it was after I’d gone to bed and fell asleep. All I could think about was how if this had just been on a disc or a tape, we would have just watched a movie, and not been troubleshooting some technological hiccups all night. But sometimes we remember the past better than it ever really was. Heck probably most times. I can also remember wrapping tin foil around TV antennae and adjusting endlessly trying to get the clearest picture possible, only to have it messed up when somebody else walks into the room and blocks your signal, all that effort to watch the ONLY thing on TV. As opposed to the thousands of choices available now on demand. As I get older, it feels like people are willing to accept less and less quality, but in reality I suppose we’re really getting more than ever before. At work the past few days I’ve been pulling my hair out trying to get a College Football Pick ‘Em contest put together on our website. My company entered into an agreement with another company to provide a web platform to facilitate the contest. Problem was, no matter what we did, it looked like crap. Just plain awful. I tried everything and finally called the provider when I admitted defeat and couldn’t get it to look good. Their response was, “I don’t know. It looks pretty great to me!” I couldn’t help but in that moment think… they really find this acceptable? They’re really OK with this? Actual real humans look at this ugly off center, non-screen fitting disaster and think, well… nothing. It’s just… normal. What I’ve thought about between that moment and now, is that while it wasn’t pretty… it facilitated something that in the past would have been pretty impossible. In days gone by, if you wanted to do the same contest, you would have had to print up entry forms. Distribute those entry forms to people who wanted to play. They’d have to go to a physical place to get them. They’d have to physically return them to you. Then it would be up to them to keep track of the contest on their own while they “play along from home”. Then all the entries and results would have to be counted by hand, hours and hours of people time. Where as now the contest is instantly distributed up to an infinite number of people, who can all play on devices that they already own, and get results in real time. All automatically. I guess if you put it that way, who cares what the magic carpet looks like? It freakin’ flies! But I valued the presentation. I valued qualities of the experience that were important to me. And I left feeling frustrated wanting to retreat back to something that reinforced my values. But going back isn’t an option. For one, as mentioned before, the past as we remember it more often than not was not a place that ever actually existed anyway. But also the energy required to keep those old ideas alive requires more and more energy the farther away you get from them. Like trying to keep a Model T running in the year 2017. But I also don’t feel the need to truly embrace the new values, or maybe I’m just taking them for granted. Where I find myself is in a place of acceptance. That the world now “is what it is” and there isn’t a whole lot I can do about it. But where do you find joy in a lifestyle of reluctant acceptance? I can see now how it’s easy to slip into the character of a person who’s frustrated, impatient, and apathetic. That’s not who I want to be, old and grumpy… and smelling bad. What I’m working towards is rather… tolerance I guess you could say. It’s a resource that I think you need to recharge once in a while. So I am working on a compromise. To complain less. To push forward more. To be productive. To be positive. However, with the understanding that I’m going to need to retreat away from time to time to recharge. To find those touchstones that reinforce my values and the things that I feel are what make me, me. That I’m still the same person that I’ve always been, and that it’s still OK to be. Change is good. I’ve pretty much decided. Don’t get me wrong, nostalgia is by far my favorite drug. But as time goes on, the more I realize every change brings about a more firm resolve in the area the change took place. This is not to be confused with stubbornness. Rather a commitment to the choice, and a new line of thinking that makes future decisions rudimentary. Change in my life seems to go in and out like the tide. Things are either changing all around me, or life is pretty much status quo. When you leave your parents house for the first time, your life is full of change. New settings, new objectives, new friends. For me, when Andrea and I got married, we had the ceremony, moved and started new jobs all in the same weekend. Three years later, within 9 months, we’d just bought the Cutlass, moved to a new house and were having a baby. Most recently I’ve started a new job at work and we’re buying a house. In between those eruptions of change I know there were things of consequence. Perhaps it’s just the magnitude of the big events that makes the things that happen around it seem more significant (most likely). Nevertheless, I look back on the big decisions and life, and I feel like I’ve really grown, emotionally and spiritually. Not just the good changes. When I dropped out of college, I decided on a career path that has ultimately been rewarding both personally and as a provider for our family. At the time it wasn’t an easy… popular… or a fun decision to make. What it did though, is make me commit to making it work. When I was in school I was constantly making terrible money choices. When the bottom finally fell out, it was dark times. The only choice I had was to move on and make the decision to never go back there again. Even the unfortunate change has resulted in firm convictions that lead to more positive thoughts and actions. Now when a credit card offer comes in the mail, it goes straight to the trash bin. I have no need, or use for it in my life. I don’t have a single credit card. Infact my credit score doesn’t exist. (So the bank tells me). Now, I can’t imagine ever having a car payment. Not knocking anyone who does. If there’s one thing I truly believe in, it’s that what’s best for me, isn’t necessarily best for anyone else. To me life is all about sacrifices. What are you willing to give up to get “X”. In order to not have a car payment, I drive older cars. I fix older cars. In exchange for that sacrifice I have a few hundred bucks every month to toss at something else. Or nothing else, and put it into savings. Luckily… I like older cars. Although I’ll be honest. I like new cars too. I’d love to be driving a new Dodge Charger. But I’ve made a choice that I have committed to making work. And if I stick to it, someday I’ll be able to go buy a new car, and still not have a car payment. And that’s what’s completely awesome. You can make it work. Whatever it is you want. But you have to truly believe it WILL work. Could be a relationship, a job, a lifestyle choice; the moment you start to second guess yourself, you’ve taken the first step towards giving up. When life throws change your way… it’s an opportunity to search within yourself and decide the path you’re willing to take. An opportunity to really confirm what it is you believe in. It’s the choice that helps bring you to that self-realization. Once the choice is made, and you’ve committed to it, every change like it which follows brings with it an answer which is automatic based on your convictions. And each change brings you closer to the center of who you are as an individual. So I welcome change. It is not always easy. But so far, I’ve usually been better for it. You know sometimes I feel bad for not posting enough, and generally just disappearing off the grid for a while. Then videos like this remind me that I shouldn’t. 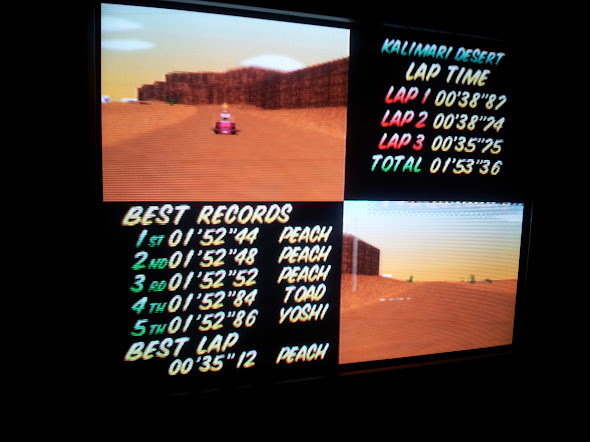 Last night I sat down and busted out some Mario Kart 64. It’s been a few weeks since I’ve played, and a long time since I dove into time trials. I looked back at my twitter and it’s been 1,086 days since I put down a time that was good enough to rank in the top five on any tracks on my cart. So that probably means it’s been at least a decade since I’ve had a time good enough to place first on any of those tracks. For whatever reason I’d been thinking about this game lately. All the hours I’d spent perfecting those tracks and to some extent if those were skills that were lost forever, or if they were still inside me, buried beneath all the work stress, car repairs, bills, and savings. Of course there’s been a lot of good additions to my life too since then like my family. 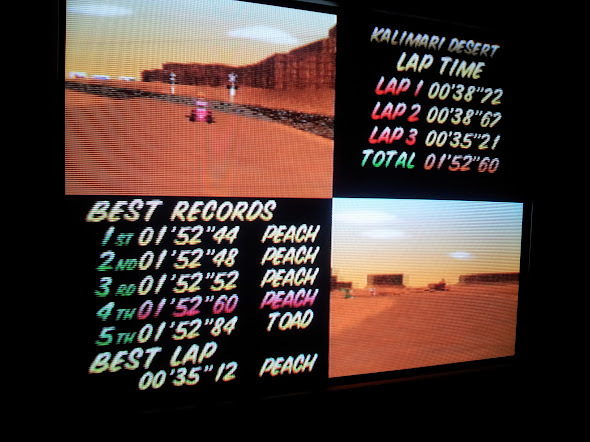 As nerdy as it sounds, my Mario Kart times were a very special thing to me in my school years. By both the good and the bad, since the late 90’s Mario Kart 64 is something that’s been steadily been pushed aside by other things that were of greater significance. Sometimes it feels like I’ve changed so much since then. With the pressure of being pulled in so many directions, I feel like it’s wore me down making me more tired, irritable and cynical than ever. Changes I’m not really proud of. So from time to time I wonder if that free spirit is still at the center of the layers of serious crap that have been rolled and caked on top since then. I guess I felt like if I could still compete with my old self at something I was best at back then, then maybe I wasn’t as different a person as I felt after all. Part of the reason it’s been 1,086 days since my last “blistering” time is because I’m always afraid that some day I’m going to sit down and not be able to do it anymore. That the “old” me really will be nothing more than just a memory. So with some mild trepidation, I picked a track I knew I’d spent a considerable amount of time on. Kalamari Desert. To put into perspective just HOW much time I’d spent racing this track, there is just a 0.42 second difference between 1st place and 5th place. That’s less time than it takes a fluorescent light bulb to turn on. This is exactly the reason I’ve been reluctant to race tracks like this because unless I really am as good as I used to be, there’s no chance I’ll ever have of ranking in the top 5. My first run through was pretty far off the mark. Relatively at least. When you start getting picky, finding 2 seconds to shave off somewhere can get pretty tricky. But I did notice that my third lap was in the ballpark of my best lap ever. So I felt like getting on the board was achievable, especially since I was literally picking this up cold after ages. After just my second run, I was really feeling good. My third lap was slower, but I’d picked up big time on laps one and two. Heck, over all I was just a half a second off 5th place and I knew I’d made some mistakes during the run. If I could just correct those, I could be on the board easily. Heck, maybe three runs would be all it would take and my skills had virtually never left me. Hell, maybe a new personal best was in store for me, all on just my 3rd run! What followed in the 4th, 5th… 12th runs were waves of frustration. 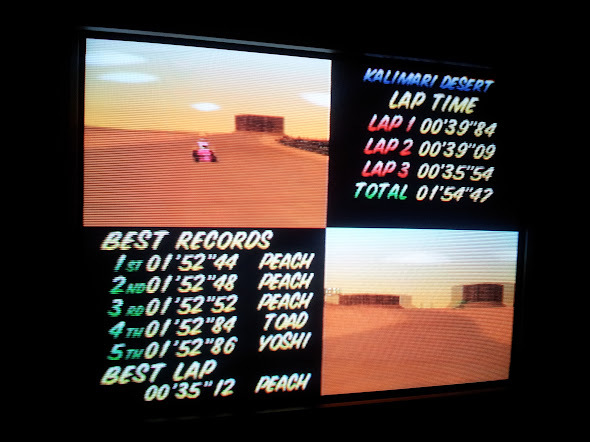 As I’d try to get more aggressive on each lap to cut into that time, I’d push just a little too far and make a mistake. I’d only finish all three laps maybe one out of every 5 attempts or so. 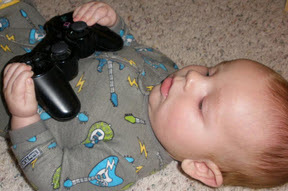 But you know what, I wasn’t too bummed by it, because this was exactly how I used to play. In fact these exact scenarios used to infuriate the hell out of me. (Maybe I wasn’t so free and cheery as I’d like to think I used to be). Actually… I think Mario Kart Time Trials is the only game that literally made me throw controllers. I would start, restart, start, race, restart, start race finish… restart… all until my thumb was literally raw. So to think I just cranked out these times at will is far from reality. Then finally after about an hour of racing this track. This one track. I finally did it. Probably my 25th attempt counting restarts. I’d never been more happy to get 4th place. Only 0.16 seconds away from 1st place. I did try a couple more runs to see if I could crank out a 1st place. But honestly, after two runs and it not happening, I didn’t even want to keep going. As lame as this is, part of me didn’t want fell my old 1st place time because of all the work past me had put in to get it. WTF is wrong with my brain? The motivation this whole time was to prove that I’m still the same Matt I’ve always been, but when I have a chance to even be better I draw a line. I’ve gotta be nuts. So someday I’ll beat that time. Maybe it will take another 1,000 days, but I hope not. I was thinking today about playing and caught myself saying I didn’t need to be playing it two days in a row because of all the other things I needed and wanted to do. Which is exactly what I’ve been telling myself for years that brought about this blog post today. So you know what. To hell with that mindset. If I have the time, and I want to play Mario Kart 64… or ANY other game for that matter. I’m just going to do it. Otherwise I end up convincing myself why I shouldn’t and end up doing something I enjoy less. I’m going to quit over thinking all this crap (see previous 1,000 words) and just have some damn fun. Time to go beat some old ghosts… in Mario Kart that is. I think it made #1 in my list of Top Ten Most Annoying Technological Advances… the Cell Phone. I cringe every time it rings or I get a text for fear that I’m getting called into work… But most of all it has fundamentally changed how we interact with each other and not for the better. Now, I’m sure I’m guilty of it at times too… so I don’t want to say I’m holier than thou… in fact, I partake in it with all the mundane crap I post on Twitter. But I think there’s definitely a huge issue when we’re missing what’s really happening right in front of us, because we have our noses buried in an LCD screens. Since that moment, this is another thing that I’ve grown to appreciate about Luke. He is EVERYTHING about what’s happening right now in the real world. And if there isn’t anything happening… he whips up something in his imagination… or just screams to let you know he wants to go play and DO something. We should all be screaming though. I can’t believe we allow ourselves to be pacified by these short little bursts of “intestingness”. Yeah, I made that word up. But really, you check to see if there’s anything new… What’s interesting? A quick smash and grab emotional fix. But the gratification burns out as quickly as it was consumed. So you come back for more quick hits, again and again. What are the long term consequences of this behavior? At best, we’ve just wasted hours and days of our lives on something that has absolutely no lasting value. How many things can you remember that you read on Facebook today? Yesterday? A week ago? A year ago? How much time have you spent using social media in those same time frames? At worst I think we are robbing ourselves of true life experiences. The kind of experiences that shape us as a person, give us our personality, and make a richer and more meaningful existence. Maybe I’m just being over dramatic. But I struggle daily with trying to find the time to not only be a responsible adult, parent, husband, co-worker and friend… but also to do the things I truly want to do. I place a high value on my own time. To think of that time gone, lost forever, never to have back… bothers me a bit. The fact that others have such disregard for what their own time is worth… frightens me. I don’t want to be 85 and wish that I’d taken the time to write a story, or build a project car, or whatever it is you’ve always thought about doing. Because someday for you… for me… for every one of us… it WILL be too late. Please don’t settle for being pacified. Be amazing. Be awesome. Be happy, justified by your own measure and expectations, and not by what others have “pinned’ or how many “likes” you’ve received. Start something today. Because if you don’t, you’ll blink and wish you had a decade ago. I like to think that one of my more refined (and useful) skills is the ability to figure people out rather quickly. For the most part people are very simple creatures, largely predictable. Once you figure out how they respond to certain inputs, it’s safe to say they’ll usually respond similarly in similar situations. If you’re able to pick up on those tendencies, you can go as far as to emphasize certain inputs to… erm… manipulate the outcome. For the most part people are inputs and outputs. I’m not saying I’m manipulative… I usually choose to just observe. Honestly I find it disappointing that most people are so simple and 2-dimensional. Feed them something they love, and they’ll re-regurgitate it right back to you. Ask them why they love it and they say “I don’t know, I just always have.” Feed them something they hate, and they’ll parrot every opposing argument they’ve ever seen, heard or read on the internet. Ask them about something neutral, and they just don’t care. All of the most interesting people I’ve come across in my life (which probably total less than 8) share two things in common. First and foremost, they have deep convictions and feelings about the things they consider relevant. And second, those convictions are rarely unsolicited, because those convictions aren’t reliant upon the acceptance of others. They are wholly their own. Both of those traits are probably my most respected qualities in a person. The ability to form your own thoughts, be passionate about them, and not require validation. Because your thoughts are your own should be validation enough. Should someone disagree with you, what does it matter? If you think something is “stupid” or “awesome” because someone else did (or didn’t), that’s not conviction, that’s influence. I don’t mean to say you should be unique for unique’s sake; it’s absolutely fine to share similar feelings as others. It is how you arrive to those feelings that matters. Don’t confuse a strong conviction with ignorance though. One of the most powerful conversations I remember having with someone was talking with a friend about salvation. You may or may not be religious, but the conversation below is a great example of what I’m talking about. “Because I believe 100% that Jesus lived and died on the cross for my sins. That as the Son of God, His sacrifice is enough to cover the sins of all humanity, including my own,” I said with great confidence. “You think believing is all it takes to be saved?” she asked. I felt a bit ignorant in that moment. I believed I was saved, because that’s what I was told I had to do. Just believe. She made me realize that just because I choose to believe something doesn’t make it real in and of itself. That what is truth is truth regardless of what one chooses to believe. That that conviction needed to come from personal revelation through action. (James 2:14-17) Those are the kinds of thoughts that I find alluring. So, honestly I’m rarely that “interesting” person I’ve been talking about. I’m pretty predictable and unsolicited myself a lot of the times. But I try to keep an awareness of it about me. I try to be my own person and do what’s best for my family and me, but also realize that my way isn’t necessarily the best way for anyone else. We are all unique individuals. Being different isn’t something we should feel awkward about. You should celebrate it! Don’t let conformism take away one of the greatest personal freedoms you’ll ever possess, and that is the freedom of individual thought. I like watching videos on YouTube of other people’s video game collections. 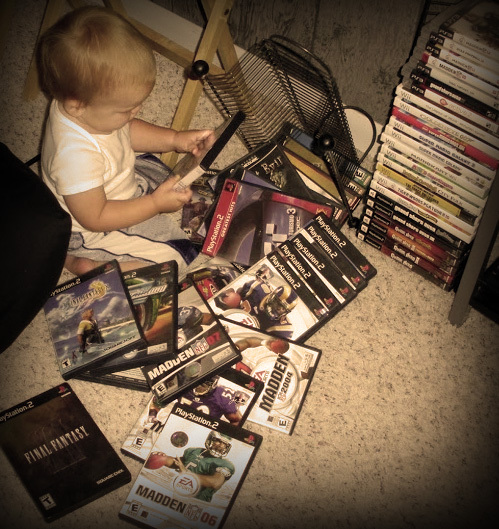 There are so many different ways to collect games. Some people go for every game ever released. Some people collected sealed, never opened games. Some collect only for a particular brand. Some like to import. Some people like collecting merchandise. And some people go for the really rare and expensive stuff. Every collector is probably a little bit of all those things. I appreciate the most extreme collectors on a preservation level. I respect the people that try to collect games and systems that are complete with all the boxes and materials that would have been included when new. Without their eccentric obsession, knowing exactly what documentation came with the original Atari 2600, for example, would be impossible now. 99% of people will say, “Who cares?” but if you want to know what something was like “when it was new” as opposed to “when it was garage saled”, then keeping this stuff intact is the only way. It’s the nuances of history, but it is history none-the-less. I’m not sure when I began considering myself a “collector” of video game junk. For the most part, my stuff is just amassed through purchases over the years and I’ve never gotten rid of it. The only game I’ve ever gotten rid of purposely, was Yoshi’s Story for the N64. But for the most part gaming has just been a past-time I have enjoyed and blown my disposable income on. Over the years I have ended up with quite a bit of stuff. To me it just shows that I’m old. 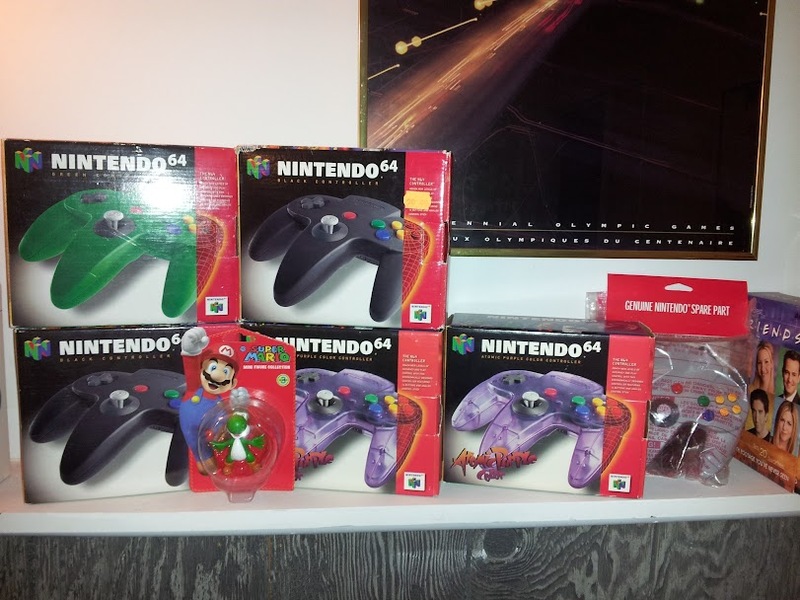 But I guess I crossed over the line to collector when I started hoarding all these brand new Nintendo 64 controllers. Since I bought them they have done nothing but sit in their boxes on my shelf, never being played with. 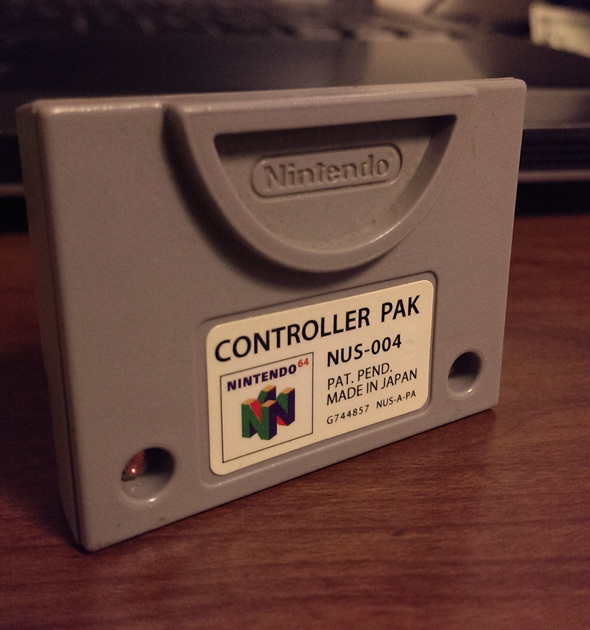 Dissatisfied with third party N64 controllers, my original plan was to use them as my current wore out. Most of them I acquired for around $30 which is about what they costed back when they were on the market anyway, so using them wouldn’t feel that bad. But it’s like that nice bottle of wine. The one that you’re saving for some really special occasion, and every special occasion that comes along, just doesn’t feel quite special enough… so that super special bottle never even gets drank. That’s when I realized what I was. So all of a sudden, my 25 years of video game purchases are now a “collection” so I’ve labeled it. Now I feel like I have to establish some guide lines. Mostly to set some limits for myself. Because when you are a “collector” that just means the amount of money you can spend on old junk instantly loses all reason. If you’ve got the cash to blow, you can buy a certified, sealed copy of “Pinball” for the NES for $19,999.99. That’s only $19,999.00 more than I paid for my loose cartridge of the same game a year ago. It’s yours for only $00,000.99! So what’s the difference between the two? Well, there’s only one difference that matters. You can ACTUALLY PLAY one of them. Don’t get me wrong, I appreciate the $20k version for what it is. A pure un-altered time warp. Maybe the only one left in the world. Sealed behind a plastic enclosure that just as well be a temporal barrier that is impossible to traverse. And if only two people decide they want it… then it has value. But one thing is for sure. If you want to play the game you definitely don’t want that one. And when it gets right down to it, I’m all about playing my games. 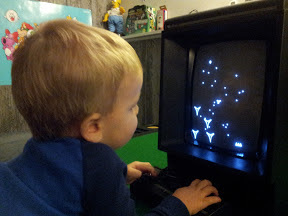 So whatever it is that I happen across, whether its the Vectrex, NES Pinball, or the Wii U, I want to make sure it’s something that I feel like I or anyone that comes over, can pickup and play. So it should work reasonably well, but not be so pristine that actually using it destroys what it is. To me the nostalgia of this stuff comes from playing it, not looking at it. I like to make sure things are as original as possible. I never got into emulators, because there were always little differences that took away from the experience. Don’t get me wrong, you could go to great lengths and get very close to the original experience. 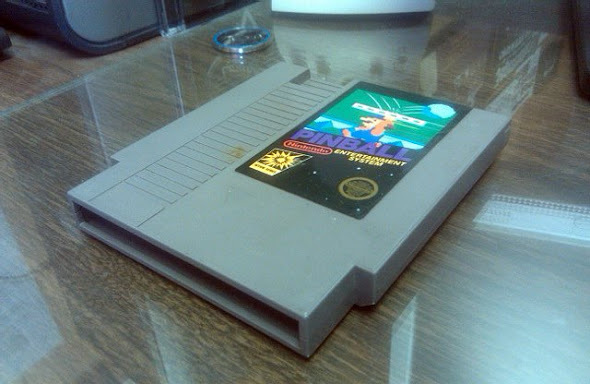 But nothing replaces blowing in a cartridge, sliding it into an NES and hearing that springy click as you push the cart down into the system. The feeling of the original controller in your hand and knowing you don’t have the ability to quick save at any moment. For me it’s all about being able to shut everything else out, and fore that brief moment, you might be able to convince yourself that it is 1987 again. That’s where the worth in my collection comes from if you ask me. Not in its monetary value. But it’s ability to transport you to another time. To actually pass through that temporal wormhole and at least let a part of you exist in that world that used to be. When you’re playing an old game, you remember how simple life used to be. I really enjoyed growing up, and I have vowed as I get older, to not forget what it was like to be a kid. Now that I have a little guy of my own it feels important to me that he is able to do the same thing. I don’t expect him to care about the same things I care about. I want him to make his own memories. But I do hope he learns to value his experiences the same way I do. You can easily get caught up in the desire for more “stuff”. But in the end, it’s only the experiences that really matter. So maybe I should finally open up the box on one of those N64 controllers and lay down some blistering Mario Kart 64 times.